God is definitely our shade. But the Bible also takes the shade concept to the next level in that as believers we are supposed to be shade to other people. He is shade and since we are his witnesses, we are supposed to be shade to a hurting world. In Psalm 80:8-10. It says that a vine would come out of Egypt and the mountains were covered with its shade.” From the very beginning, the new nation of Israel, born from the Exodus, was to be shade to the rest the world. Israel’s mission was to be God (shade) to world. In Isaiah 32 it says. When the Messiah comes, each man will be a shelter from the storm, a stream of water in the desert, in the shadow of a great rock in a thirsty land.” The idea is when the Messiah comes, his followers will show a hurting world what he is like by being shelter, water and shade to them. It is interesting to see if you apply these thoughts in Psalm 80 and Isaiah 32 to the early church, in Acts 5:12 – 16, just Peter’s shadow falling on people was healing them. It’s evident from these verses that God wants to create a community that will bring shade to a hurting world. Our mission in life, the reason we are here is to be shade to each other. That is the whole purpose of the church, the community of believers. Just as God provides shade to us, so we are to be that same shade to someone else. We live in a world of intense heat; most people are barely making it and God has chosen us to be a broom tree for them to get some shade from. We are not only promised shade, we are called to be shade. To be part of this community of shade requires at least a couple of things. First, we have to be willing to give of our time to be that shade. God wants to use you to be shade to certain people, but you have to be willing to get involved to help them see the shade that God is providing. We probably won’t be able to make the heat go away; the broom tree doesn’t fix the problem, it’s just there for shade. Our job is to help them get around the next bend in life and let them taste God’s sweetness as He provides some relief from the heat. This is comforting to me in that when we try to help people, we don’t have to have the answers; usually there’s nothing we can say or do that will fix the problem. We are just called to be shade – just be there to show what God’s sweetness is like. We call on God in a crisis and say,” God where are you”? God replies back,” where are you”? You are my witnesses, you are the living water, the shade, the instruments I use so that the world may know what I am like. God has chosen us to be a broom tree in the desert of life. May we be God’s shade in a world that is desperate to know what He is like. 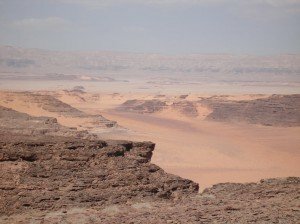 During the time we spent in the desert we were constantly reminded of the biblical imagery that is so wonderfully found there. Until you’ve actually been in the desert, there’s no way to describe how hot and desolate it really is. A lizard can’t live there in the summer; it’s often in the 115° to 125° range. 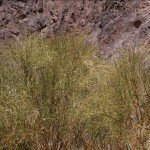 One of the plants found there that is talked about in the Bible is the broom tree, or “Rottem”. 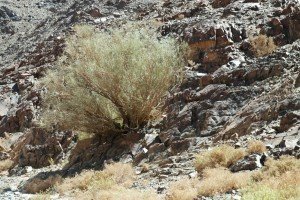 It is one of the main shade trees of the desert. Although more of a bush than a tree, it was very important as shade to the early wilderness travelers. Its roots also produce a very hot fire and make the best charcoal available. There are two Biblical stories that mention the broom tree. The first one was the story of Hagar and Ishmael in Genesis 21:8-20. Although the NIV says bush, the Hebrew is “Rikman” which is root word of “Rottem”. The second story involves Elijah in 1 Kings 19 and here it specifically says, “he came to a broom tree (Rottem) and sat under it.” These 2 stories both create a desert lesson involving heat and shade. In both cases, the heat was unbearable and overwhelming and the characters look like they were not going to survive it. But God came and provided a moment of shade in their desert experience, and they were able to continue on their life journey. The shape and size of the tree is itself a lesson. It is not a big tree at all, barely providing enough shade for one man and then not much. It’s not anything like what we Westerners would call a shade tree. The image of the broom tree is ,”just enough.” When you come to a desert moment in life, as Hagar and Elijah did and the heat is excruciating and your think you won’t be able to take another step, God is there to provide you a little shade to get you by. The image is not deep shade or air-conditioning, but just enough shade. The world we live in is one of intense heat, but around the bend is a broom tree, where we can get a little shade, a little rest, to be able to keep going on life’s journey. That leads us to the second part of the shade image, which I’m calling Shade II. When you stay in the desert for several days, as we did while on our recent trip to Egypt and the Sinai Desert, it leaves you with some distinct impressions. I want to write this little short faith lesson separately, because it applies to every desert lesson. When you go to the desert, at least 2 things hit you quickly. As you step out of the green of the Nile and into the harshness of the desert, the contrast is overwhelming. You want to immediately turn back – the desert is not a place you really want to be. Also, as you get farther into it, you are overwhelmed by the fact that it is everywhere you look. It kind of smothers you, as it is everywhere you look and there is no relief in sight. The faith lesson is this- we have left the impression, somehow, that when you join the Jesus movement, you get to stay in Egypt. Life is going to be okay, even better now that you are a Christ follower. In fact, if the biblical story is our example, just the opposite happens. We have to leave Egypt, and go to the desert! We set people up for a faith crisis and a disaster, when we make following Christ like the Garden of Eden, instead of the desert. If we are supposed to be “looking good” and having it all together as Christians, then we have to fake it when the heat from the desert is killing you. We try to leave the impression that we never need help. We’re glad to give help, but we don’t want to ever show ourselves, where we’re actually in need ourselves. The desert puts you in the spot where you are forced to say, “I need help”. When you think about the nation of Israel, its identity and character are formed from the wilderness. All the founding fathers were desert people, Abraham, Moses, Elijah, David, etc. They lived in and were shaped by their environment, the wilderness. God’s people understood the desert. So many biblical images come out of the desert. The desert becomes a picture of our walk through life. As we experientially walk out our life situations, we learn to trust God to take care of us. We have both big ” T” tests, and little “t” tests that are God’s teaching moments where he says “trust me.”. When the heat is intense and trying to consume us and we are wondering how much more we can take, these are the moments where we meet God. These teaching moments change us into people who know we can’t do it on our own strength, that we must have our daily sustenance from God. You wish you could tell people that if they join the Christian movement that their problems would be less and less until we went to heaven, but that’s not going to happen. Until we go to heaven, the desert experiences are where God meets with us and gets to know us intimately. As we walk it out, we begin to know ourselves more intimately, also, and discover what’s in our heart.